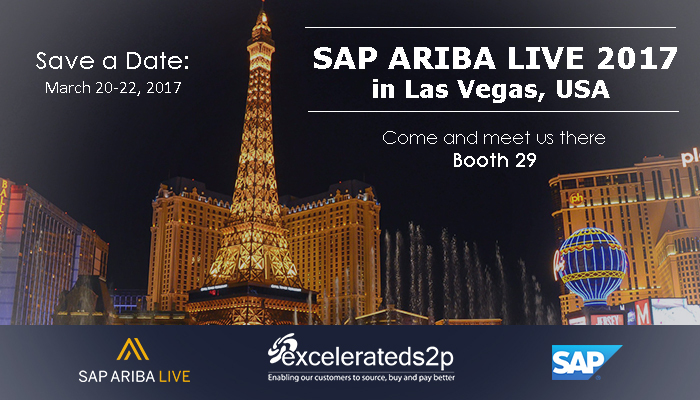 ExceleratedS2P is attending one of the most prestigious SAP Ariba Live event in Las Vegas, from the 20th until the 22nd of March. ExceleratedS2P enables their customers to source, buy and pay better by providing complete Ariba solutions through advisory, implementation and support services to assist your company on your Source to Pay transformation journey. We have hands on experience of implementing the entire suite of Ariba solutions including Guided Buying and have deep integration with SAP ERP experience. We have also built industry add-ons and innovative solutions using Ariba API’s. As a global Ariba partner ExceleratedS2P can bring some of the best source to pay and Ariba consultants in the industry to help your company to increase productivity, efficiency, control and compliance. Please come and meet our experts at Booth 29 or email us on info@excelerateds2p.com to arrange a one to one meeting to see how we can help your organization.